Besides that real scary crazy mid-night stalking, I am sure each one of us has had a stint with a little harmless Facebook stalking. Unlike LinkedIn, or no more in trend Orkut, Facebook does not allow people to know who visited their profile.So it is safe to stalk on Facebook. Plus for each profile, there is a possibility to keep one's privacy intact by sharing defined updates amongst friends, with public or with restricted audience. And if you do not want someone to stalk you, just block that person! I believe that after celebrity crushes, exes are the most stalked items online, where one wants to know what's up with them. Internet is a great invention bestowed upon mankind. 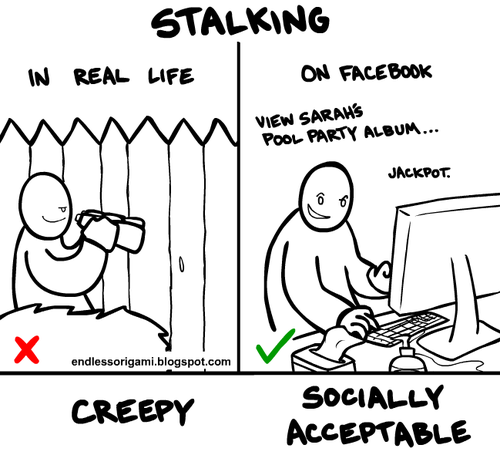 It is not that creepy to stalk when you are on social media. Remember the last scene from The Social Network, Mark Zuckerberg's character was viewing the profile of his ex. Talking of the ethical aspect of it, is it good, bad or okay? Ex is someone you fell for, someone who broke your heart, or may be you broke his/her heart, or maybe the situation required you to part ways and you keep wondering was it for real, so we go virtual to keep the memories alive and shed a tear or two. 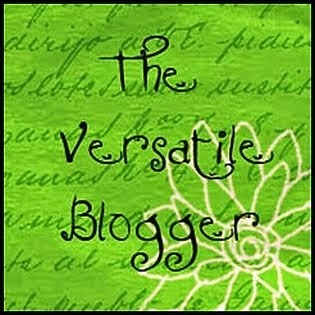 Author's Note: Stalking is fine, as long as it does not scare someone. Plus it should not invite an emotional turmoil to you. Ensure that you are not falling in an emotional rut by indulging in a harmless ride on the memory lane. P.S. : It is fine, it leads you to understand that the other person has changed. It is not more that same guy/girl that you fell for. You turn off that craving to stalk with an understanding that it is just an emotional assault you are bringing to yourself. Thank God for that block button. Works in the interest of the victim :). Only when the victim knows about being stalked. Thanks for sharing. 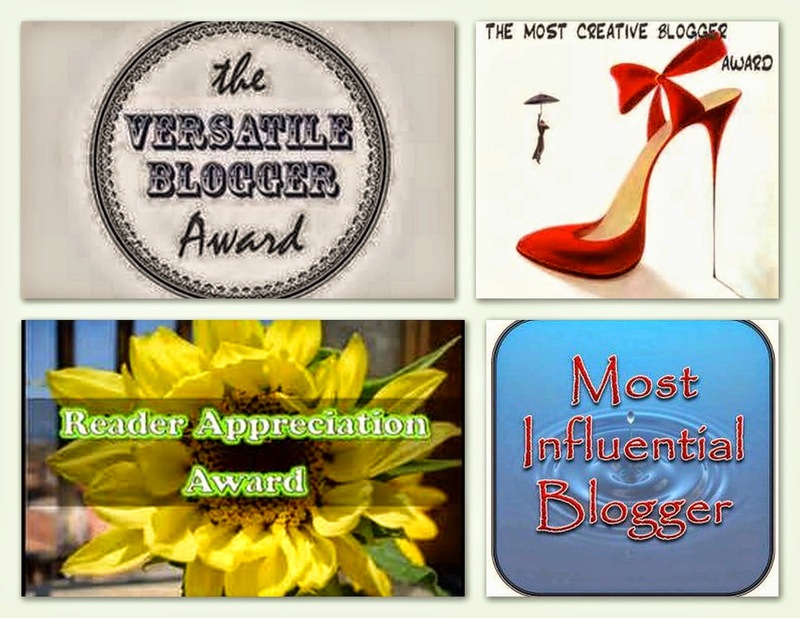 Thanks also for visiting my blog. All the best with the challenge! N that is what privacy settings are for. Selective information for the stalkers. A good post on a timely topic. Haven't really thought much about it so far! I usually stalk someone's profile when I am very bored to death :) But I guess stalking takes a dangerous tone when it's becomes obsessive and sometimes leads to even hacking profiles. Totally agree. It is dangerous not only for the victim but also for the culprit. I hate stalkers both in real and virtual.. Virtual is worst... The worst is when the stalker questions you about why you liked a particular page.. i will be like Oh god.. i dont wanna live on this planet anymore! I know. My sister experienced smthing like that and now her privacy settings does not allow people to view pages she like on fb. I generally fight back with real life stalkers. They are creepy and irritating. i love your comic and appreciate your points! with the web access we have, it's hard to judge others for stalking (like maybe the govt?) when we do it ourselves... i guess it's controlled stalking - and real life where someone can touch you is more dangerous than virtual, but still creepy if done with the wrong intentions - it all boils down to be careful what you do or post cause anyone can see! 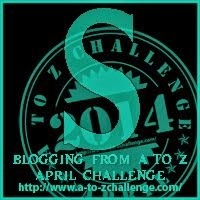 though provoking a to z posts - great job! Ahaa. That government point. I put so much against a politician that I wonder if he gets to power he will get me arrested. While Zuckenberg never thought about providing much privacy options, am glad he did add the block button! He was a stalker himself. Kudos for a balanced approached you took!!! Stalking is a strong word. If it is for fun do share by terming it easy. Hahahaha I don't stalk. profiles of xyz doesn't matter...But I love profile hopping :)) I love to look at different photographs and people have amazing ideas of profile pics. Haha. Long blocked list. I like it.